Can Companies Like Uber, Equifax Find Redemption After Scandals? It's rarely smooth sailing for any company, but sometimes the brands we know and use run into choppy waters and their actions can determine whether they sink or keep going. Look no further than Equifax, which is being criticized for a botched handling of the worst data breach in history, exposing the personal information of as many as 143 million people. "They became the enemy of the American people and they lost the trust of their customers and failed to do their job," said Eric Schiffer, chairman of Reputation Management Consultants. "In these situations, it is really about recovering credibility, and Equifax's credibility hit was worse than anything an opponent of Mike Tyson ever faced." Of course, every company's reputation-based crisis has its own DNA and varying degrees of impact. They can either go the way of Volkswagen, which survived its diesel emissions scandal to become the world's best-selling automaker — or end up more like Enron, which crashed and burned after its systemic accounting fraud was revealed. Uber has faced a number of hurdles this year, ranging from workplace harassment issues to lawsuits and the resignation of its CEO to getting banned in London this week. Yet somehow, the company has maintained a Teflon-like exterior. Barbara Kahn, professor of marketing at the University of Pennsylvania's Wharton School of Business, told NBC News in an email that Uber was a "tricky case." "Uber’s fall from grace has been tied closely to the downfall of former CEO Travis Kalanick," she said. "His removal and the appointment of a new CEO certainly helps, but I think the organization will need a cultural shift from top to bottom to really make a difference." While chief rival Lyft has benefited from Uber's woes in some markets, the company has maintained strong growth. But "while you may see Uber's numbers looking good," there's no telling what they could have been had they not faced a tough year, Schiffer said. "Now their job is to begin to lead by principle and lead with character. They are a large company. They don't need to act like a startup with an Alexander the Great mentality," he told NBC News. But it's that perceived mentality that has both benefited Uber and its customers with rapid expansion while also getting the company into trouble with regulators in some cities. A different city can mean new regulations — and when Uber learned last week that London was not renewing its taxi license over safety concerns, jeopardizing the jobs of 40,000 drivers, the company's new CEO, Dara Khosrowshahi, struck a contrite tone in an open letter published in the Evening Standard newspaper in London. 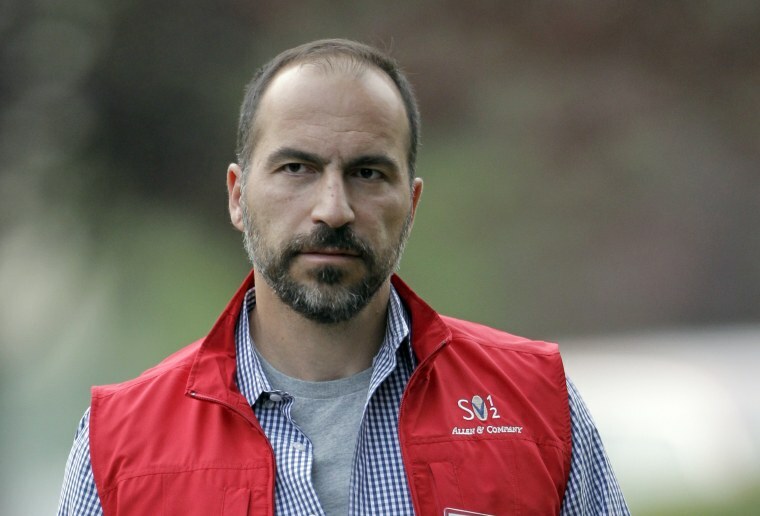 "While Uber has revolutionized the way people move in cities around the world, it's equally true that we've got things wrong along the way," he said, apologizing "on behalf of everyone at Uber globally...for the mistakes we've made." Equifax and Uber are dealing with similar — yet drastically different — situations, but Schiffer said he believes redemption is possible with strong new leadership and honest communication with stakeholders. "Right now, the battle is over trust," he said. Plenty of other companies we know and love have also weathered the storm and come out on the sunny side. "There are certainly many instances of companies who have responded to bad news about their brand/company in proactive, timely ways and have mitigated the decline in brand reputation," Kahn said. Perhaps the most classic example: Johnson & Johnson. In 1982, a number of mysterious deaths were linked back to Tylenol that had been tampered with and laced with cyanide. At the time, Johnson & Johnson controlled about one-third of the market share for over-the-counter pain relievers. Shortly after, according to news reports, its market share plummeted to around 8 percent. The company was able to win back consumer trust with a swift response, which included working alongside FDA officials to implement tamper-proof protections such as the now-ubiquitous foil seal, and introducing caplets that would be harder to tamper with. Today, the company has a value of more than $348 billion and remains a leader in the packaged consumer goods space. Two years ago, "Dieselgate," the VW emissions cheating scandal, threw the automaker into a massive crisis. The firm's then-CEO apologized and pledged to get to the bottom of what happened. The company also launched a recall to fix affected vehicles. And while it's cost the company close to $30 billion, the German carmaker is still one of the world's biggest in the world. Traditional retail continues to wither away, but Amazon is thriving. However, even the biggest online retailer isn't immune to criticism from President Donald Trump who said in a tweet that "towns, cities and states throughout the U.S. are being hurt — many jobs being lost!" The company has moved full speed ahead on creating new jobs and breathing life into warehouse towns with thousands of new fulfillment center jobs. Then there's Yahoo. While the company was in the middle of being purchased by Verizon, two gigantic hacks were disclosed, sending investors fleeing. But the internet company is still around — though it ended up being acquired for slightly less — under a new parent company called Oath.